Hi there! 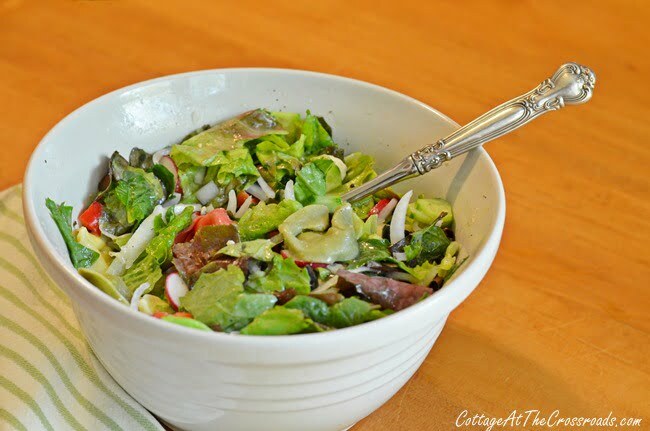 I thought I’d share a salad recipe with you today that we’ve eaten several times within this last month. Our garden is producing lots of lettuce and spinach right now so we eat at least one salad a day. 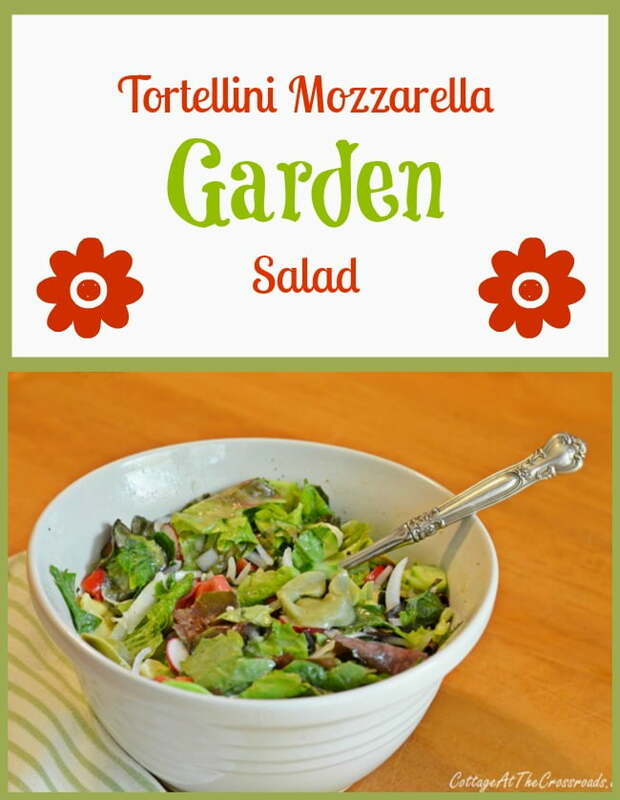 I came up with this recipe for what I’m calling my Tortellini Mozzarella Garden Salad quite by accident. 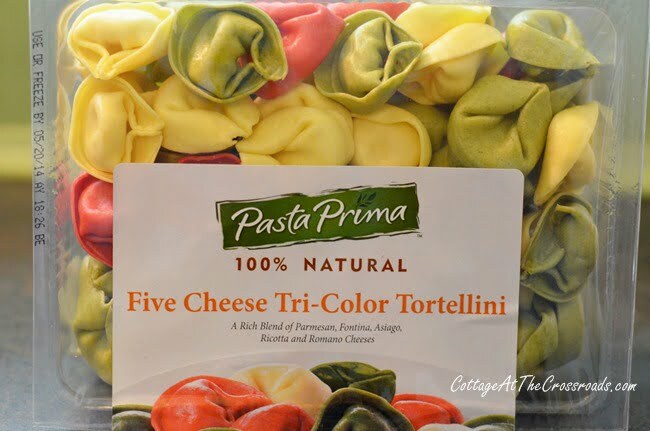 You see, last month I made some appetizers for the Civitan Golf Benefit Party, and I had some left over tortellini and mozzarella that I didn’t use. I am not one to waste anything, so the next day I put them in a salad that I was making. 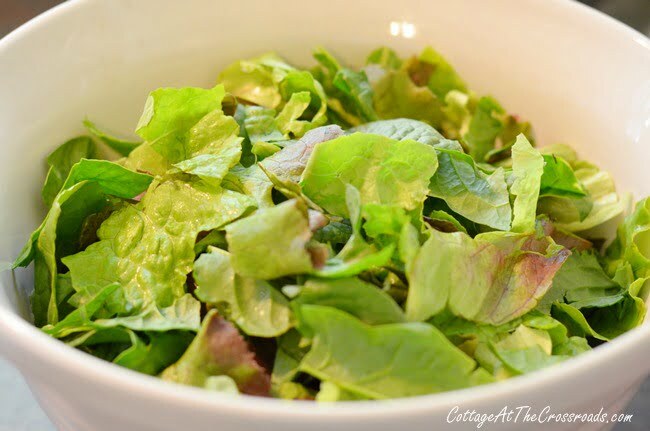 I don’t know why I’ve never thought to put those two ingredients into a garden salad before, but they are awesome in a salad! 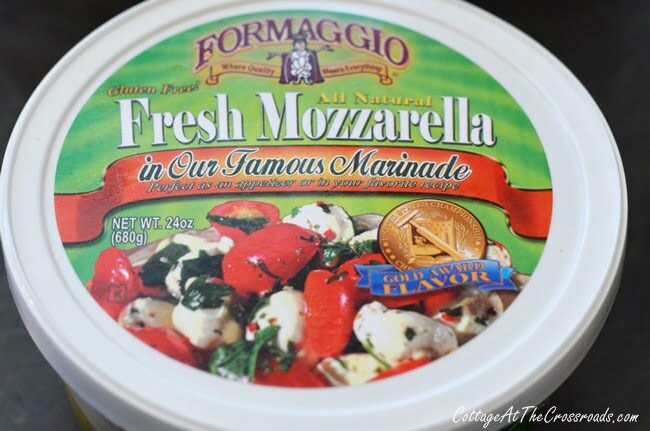 The cheese-filled tortellini and the additional mozzarella offer enough protein to make the salad a full, hearty meal. 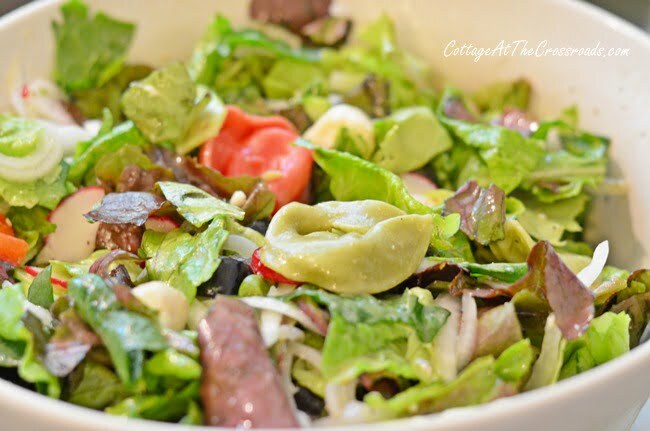 To make this salad you will need some fresh tortellini which you will find in the refrigerated section of your grocery. Cook it according to the package directions (about 5-7 minutes) and let it drain and cool. I only use half a package each time I make this so I refrigerate the other half and use it in another salad within a day or so. While I’m waiting for the tortellini to cool, I start preparing my salad by tearing different types of lettuces in a bowl. I use romaine, red and green butterhead, and some baby spinach because that’s what we have growing in the garden right now. Next I chop an onion into little slivers. 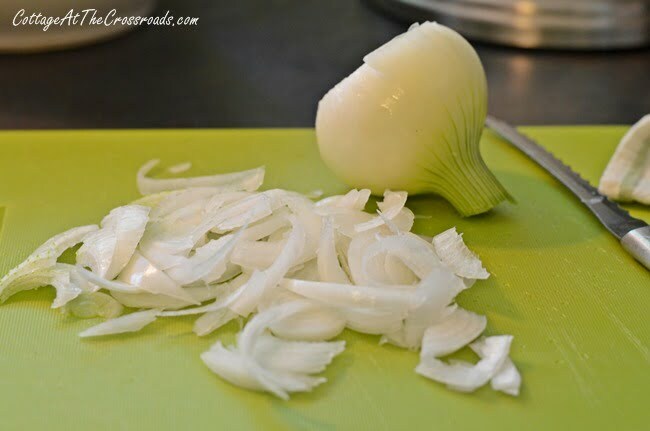 I actually used 2 small onions from our garden, but you could use any sweet onion such as a Vidalia. 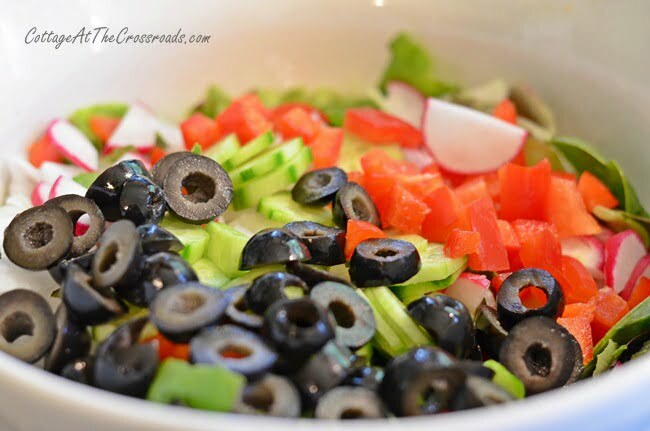 And then I add a small can of sliced black olives, minus a few that I nibble on before they even hit the salad! Now this is the ingredient that really makes this salad-these fresh mozzarella balls that are marinated in olive oil and spices. I purchase them at Sam’s, and I only use about 10 of the balls in each salad. But when you scoop them out of this container, be sure to get a spoonful or two of the olive oil and spices with them and put it into your salad, too. Makes it super tasty! 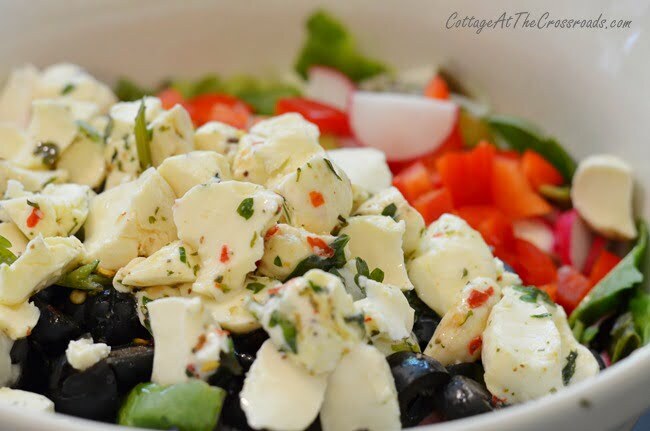 I cut up the mozzarella balls into smaller pieces before adding them to the salad. This is the salad dressing that I use. 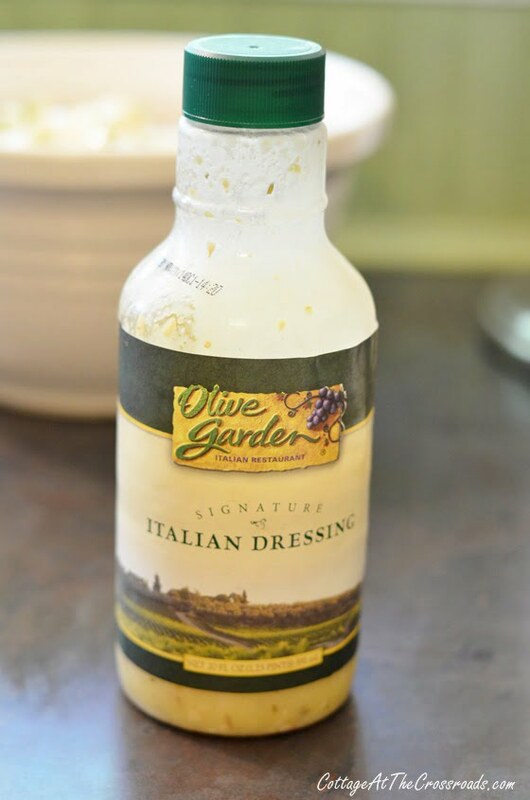 Sam’s sells the Olive Garden Italian Dressing, but you could use any dressing of your choice. Toss everything together to make sure the tortellini is covered with some of the dressing. Oh, my! If you’re like us, you’ll find yourself making this more than once! Enjoy! I’m pinning this recipe – I think it will be the perfect thing to make when my vegetables and lettuce are ready for harvest! Jane, salads in the summer are the best. 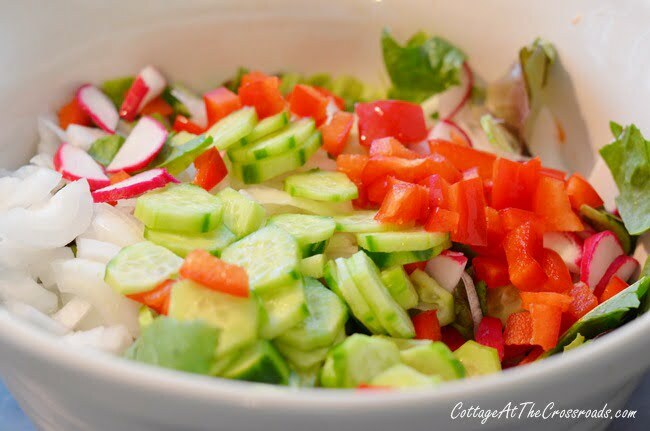 This is a great dinner salad… mega YUMMY! Your pictures are making my mouth water! Oh how I love me some salad and this one looks sooooo good! Jane, I had to chuckle over Leo’s comment 🙂 Your salad combo sounds wonderful with the addition of the tortellini and mozz! This salad looks so yummy, Jane. I’m sure it’s even better since you’re using fresh-from-your-garden veggies. Oh MY! This looks DELICIOUS!! I’m pinning then I’m heading to the grocery store. Thanks for sharing! Ya’ll have got to try this. It’ll make your tongue slap your brains out. Too descriptive ? Sorry, but it’s really good. My kind of salad! Sounds delicious. I pinned this. It will be great for our church women’s luncheon. Thanks for sharing. This is my kind of salad! It looks delicious and I can’t wait to try your recipe. Yum!